What’s the most important aspect of a great scenic overlook? This one should be pretty obvious: height. And Chattanooga certainly has no shortage of that. 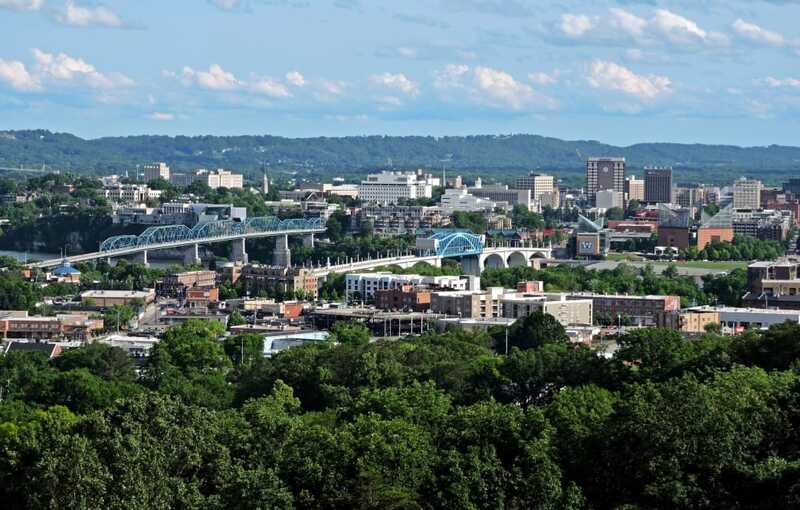 Nestled in a valley amid stooped southeastern mountains, Chattanooga has plenty of places to get up high and check out the amazing scenery for miles around. The area is absolutely teeming with spectacular overlooks to enjoy serene sunrises, glorious sunsets, relaxing mid-hike picnics and just regular Tuesday afternoons. 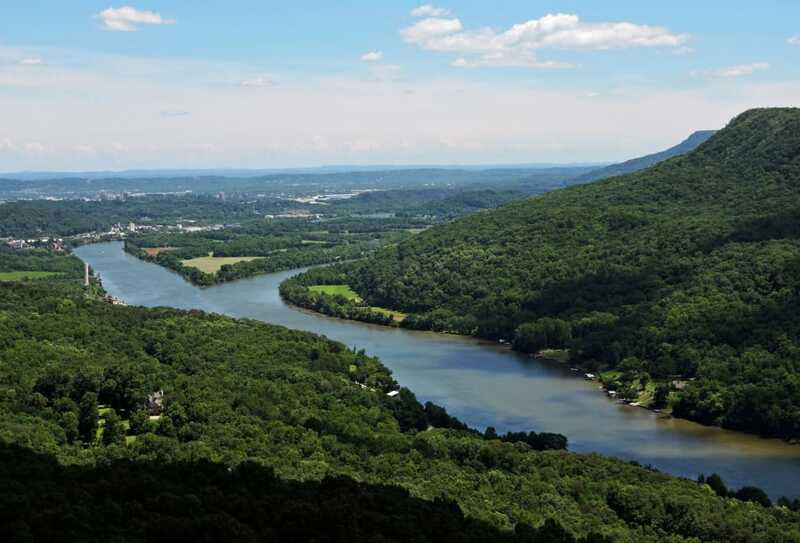 Here are eight of our favorite scenic overlooks in Chattanooga to discover for yourself. 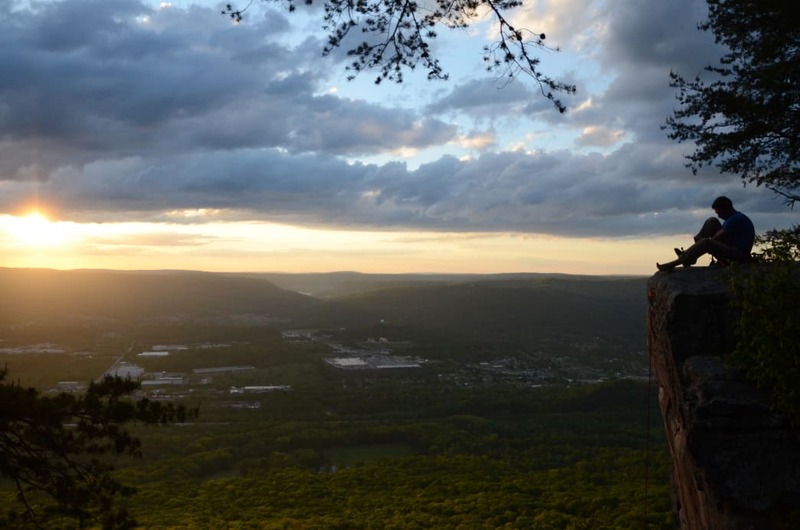 Sunset Rock offers one of the most iconic views of Chattanooga. 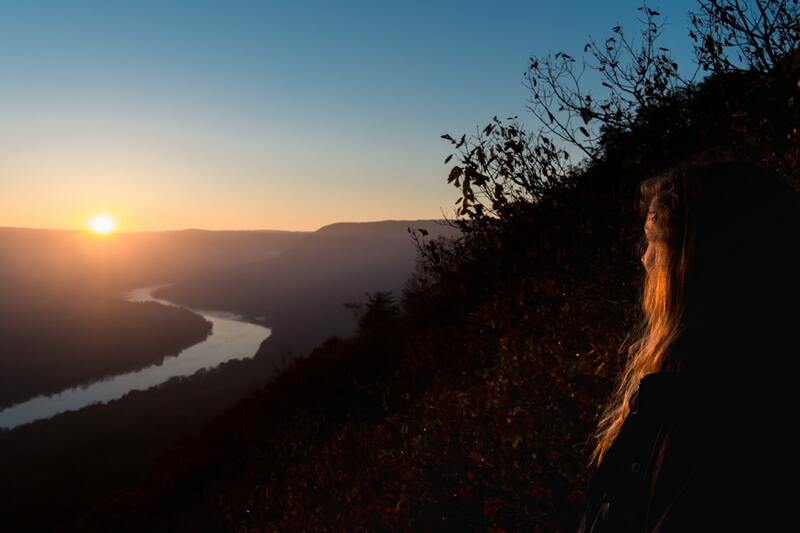 One of the most iconic overlooks in Chattanooga, Sunset Rock beckons hikers, trail runners, and sunset watchers from all over to enjoy its gorgeous view from the western side of Lookout Mountain. Located just a hop, skip, and a jump from its small parking lot, Sunset Rock is easily accessible. The overlook can also be incorporated into hikes of various lengths, by taking the short steep trail up from Cravens House or by tacking it onto a larger loop in the extensive Lookout Mountain trail network. However you choose to get there, Sunset Rock will be waiting for you with a place to rest and a brilliant view. Signal Point offers excellent views of the river gorge below. Pair it with a trip to the nearby Julia Falls overlook. From the large NPS parking lot in the historic section of Signal Mountain, visitors need only walk about 100 yards to encounter a spectacular peek into the river gorge below. While ending your visit here certainly won’t leave you disappointed, truly reaching Signal Point requires a tricky descent through “The Mousetrap,” a set of wooden stairs and rails that take you to the very edge of the mountain. After an admiring gaze from this overlook, continue down the trail to make your trip a twofer: the Julia Falls Overlook is only about a mile further and offers a glimpse at a regal waterfall pouring from the side of the mountain into the lush gorge. It takes a bit of work to get to Edward’s Point, but the views are worth it. Just around the mountain from Signal Point, Edward’s offers a large slab for resting or sunbathing with an unbelievable view of the river valley and the surrounding mountains. As part of the Signal Mountain trail network, there are several ways to get to Edward’s Point: by foot, bike, or ATV. The most popular access point is via the ATV path, which winds about two miles from a pull-off on Edward’s Point Road to the overlook. This is a popular spot, but make the trek in the early morning or on a weekday and you might get the place all to yourself. Enjoying a scenic sunrise from Snooper’s Rock. Located deep inside Prentice Cooper State Forest, Snooper’s Rock is probably one of Chattanooga’s most tucked away overlooks. Once you find the parking lot, it’s only about a quarter-mile walk to find a panoramic view of a unique S-curve in the river as it winds through a secluded section of the gorge. Snooper’s can also be incorporated into a 10-mile jaunt of Mullins Cove Loop, which takes you on a grand tour of the mountaintop state park. A one-mile roundtrip walk will bring you a legendary view in Cloudland Canyon State Park. The trail follows the canyon’s rim and offers continuous scenery along the way. Don’t miss the small descent to the main overlook to snap a picture of the best view in the park. Cloudland Canyon requires a small day-use fee and offers campgrounds for overnighting, making it a perfect place to spend the weekend exploring above the clouds. Stringer’s Ridge, known for its trail running and mountain biking, is just two miles from downtown Chattanooga. Popular with locals for trail running and mountain biking, Stringer’s Ridge offers several miles of trails right outside the heart of downtown. The park has one overlook that affords an unparalleled view of the city, displaying its unique architecture, bright colors, and the Tennessee River. From the main parking lot at Spears Avenue, the hike to the overlook is about a mile. The wooden deck makes Stringer’s Ridge a great spot to have a picnic or watch the sunrise. 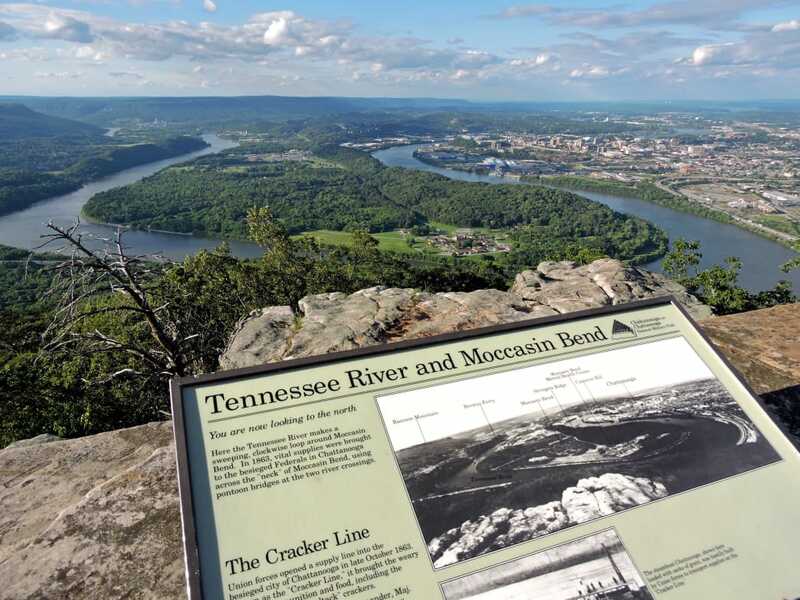 Moccasin Bend is one of Chattanooga’s signature views. Point Park is just one of Lookout Mountain’s many claims to fame. Aside from its spectacular view of Chattanooga and the Lookout Mountain Battlefield below, the 10-acre Civil War memorial park offers educational experiences and is a haven for local and visiting history buffs. A paved path that meanders the grounds surveys several monuments, historical tablets, and Confederate artillery positions. 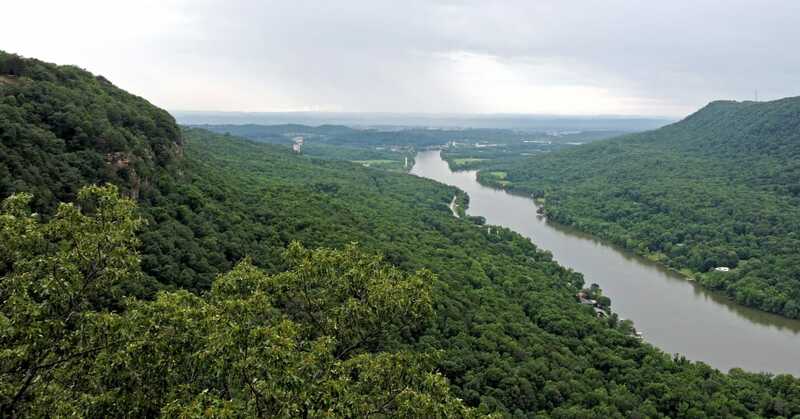 For those who can’t get enough, the nearby Ochs Memorial Observatory displays exhibits on Civil War signaling, photography, and the fascinating history of Moccasin Bend, which can be seen on the river banks below. Entrance to the park requires a fee of $5 per adult. The ultimate panoramic view would be to gaze down from a hang glider, but fortunately, you don’t have to strap yourself to a giant kite to get a great view and a taste of what hang gliding is all about. One of Chattanooga’s most unique overlooks, the flight park offers a fantastic view of the mountains rolling into the distance as well as the opportunity to see dozens of gliders zooming around the sky. The roadside parking on Lookout Mountain deposits visitors at precisely the perfect spot to get an A+ view of gliders launching from the nearby ramp or being towed up by planes from the valley below. When the weather is ideal, visitors can witness a continuous stream of gliders circling, spinning, swooping, and swerving overhead. No hike is required, making this the perfect spot for an evening picnic or a quick side trip from other Lookout Mountain attractions. Forbes' Weekend Guide to Chattanooga calls The Edwin Hotel "the chic, design-minded boutique hotel it [Chattanooga] deserved."